And Russia could be to blame. In the summer of 2016, a French magazine published some curious photos of a Leclerc main battle tank of the French Army, painted in the jagged new Scorpion camouflage scheme—and sporting a massive 140-millimeter, fifty-five-caliber gun. You can check out pictures here and here and here. The huge smoothbore gun came from the experimental T4 gun turret built in 1996 by GIAT and the Bourges arsenal. But after initial testing, the French military shelved the oversized weapon for more than a decade, before installing it onto a turretless Leclerc MARS armored recovery vehicle in 2015. The new sixty-ton tank was dubbed the Terminateur by STAT, the French army technical section. The vehicle can reportedly carry either twenty-two or thirty-one enormous two-part shells measuring 1.5 meters long. Reportedly, the tank’s autoloader was tested, as well as the vehicle’s ability to fire while moving. There are three primary methods of improving the armor penetration of tank shells: larger shell diameter (which makes both kinetic penetrators and shaped-charge warheads more effective), longer gun barrels to help generate higher muzzle velocity for kinetic shells, and improved ammunition. The last approach is by far preferred, because it doesn’t require reengineering the tank—and making it lug even more weight. Tank main guns have topped out at 120 to 125 millimeters in shell diameter since the end of the Cold War. But in the 1980s, both NATO and the Warsaw Pact contemplated leaping up to even bigger 140- or 152-millimeter guns to a steal a march in the arms race. In theory, the increase from 120 to 140 millimeters could offer double the kinetic energy. Even as the Cold War ended and funding dried up, France, Germany and the United States collaborated in the 1990s on a project known as Future Tank Main Armament, which considered a variety of experimental weapons, including a plasma-cartridge electrothermal-chemical (ETC) gun and an electromagnetic rail gun. An enlarged 140-millimeter cannon was by far the most conventional of the proposed armaments, so all three countries tried installing one on their respective main battle tanks, resulting in the experimental American M1 CATTB “Thumper” and the German Leopard 2-140. But militaries worldwide have resisted the allure of heavier ordnance on their tanks. Larger shells equate to fewer main-gun rounds and a heavier vehicle chassis to absorb the recoil, which could amount up to sixty tons for a 140-millimeter weapon. Indeed, the latest models of 120-millimeter M829 sabot shells used by American M1A2 tanks have improved effective penetration from an estimated 540 to 800 millimeters without increasing shell diameter or barrel length. Indeed, the 1991 Gulf War demonstrated that the 120-millimeter guns on NATO tanks overmatched the armor of contemporary Soviet tank designs by a sizeable margin, so Western militaries had had little reason to contemplate larger guns when better ammunition would do the trick. However, Russia may finally be closing the gap with the T-14 Armata tank, which Russian media claims has a front hull armor equivalent to one meter of Rolled Homogenous Armor versus kinetic shells. (It is speculated the T-14’s unmanned turret may have thinner armor.) More importantly, Russia-EU relations have deteriorated since Moscow’s seizure of Crimea, making countering Russian tanks a priority once again. 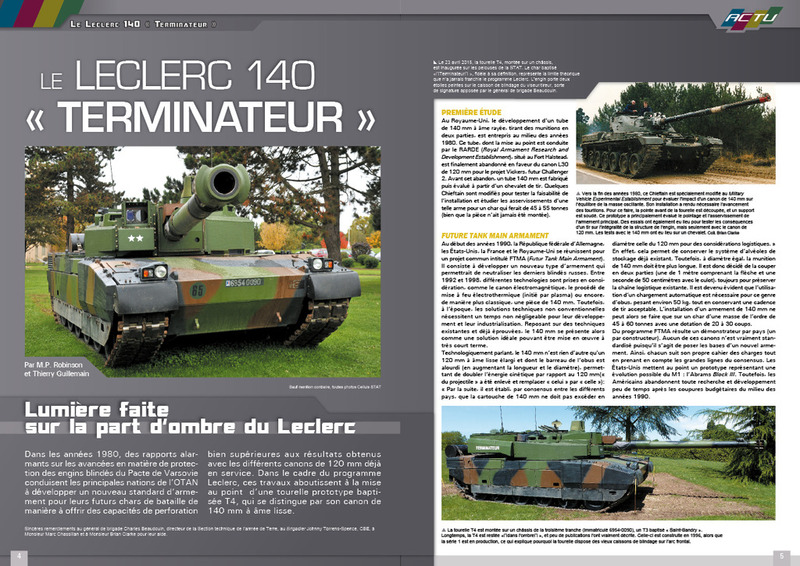 Now, the Terminateur is a technology demonstrator, not a prototype, and does not in any way indicate that the 140-millimeter gun will be making its way to the two hundred Leclerc tanks currently active in the French Army. These vehicles are instead undergoing a 330-million-euro modernization program due for completion in 2020 that will fit them with new battle management and command-and-control systems, a remotely operated machine gun (so the crew isn’t exposed while firing), modular armor kits, jammers to foil remotely-detonated IEDs, and new air-bursting antipersonnel shells. These upgrades mostly are oriented towards counterinsurgency and urban warfare, not fighting opposing tanks. However, the Terminateur does hint at the direction in which European tank design may be heading. France and Germany would like to maintain the technological edge of their smaller tank fleets, but object to using American depleted uranium sabot shells. Accordingly, Rheinmetall has developed a powerful new 130-millimeter gun with a fifty-one-caliber barrel estimated to boost penetration by 50 percent over the current crop of 120-millimeter guns. This weapon could potentially be installed as an upgrade for Leopard 2 tanks, and may possibly feature as the main armament for a next-generation Franco-German tank program called the Main Ground Combat System, slated to enter production in the late 2020s. Russia, meanwhile, has also tightened its military spending, and it will likely be some time before T-14 tanks comprise a significant portion of its tank fleet. Every major tank-producing country has toyed with the idea of even bigger tank guns: the United Kingdom tested a 140-millimeter cannon on a Chieftain tank in the 1980s, the Russian military has loudly proclaimed its interest in installing a 2A83 152-millimeter gun on the T-14 Armata that can fire nuclear shells, and China has developed a 140-millimeter gun for its Type 99 tank. But so far, testers have found the big guns to be impractical and unnecessary. Continued interest in experiments like the Terminateur suggest that may eventually change, but not necessarily very soon.